The PSSC’s March 22, 2014 meeting was held in the heart of Orange County at two gardens: (a) the home and garden of Ralph Velez, in Westminster; and (b) Palm Island in Mile Square Park, in nearby Fountain Valley. 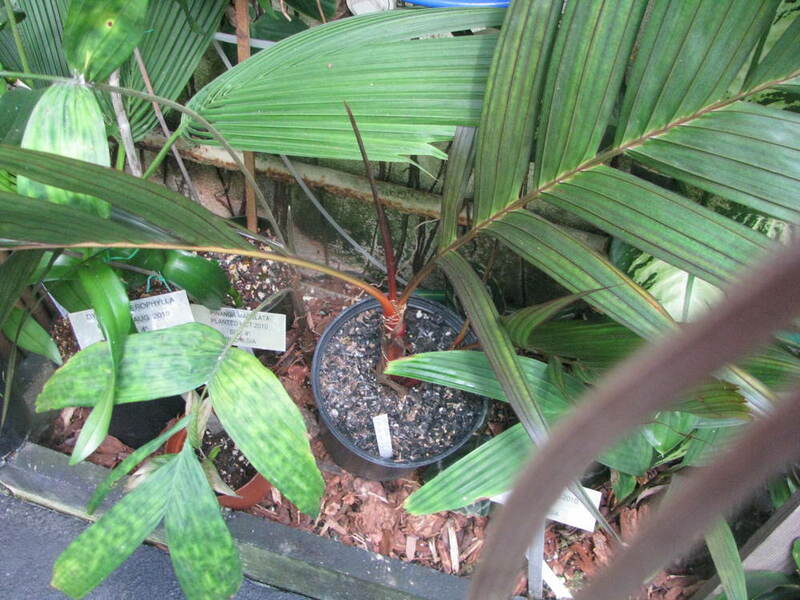 Tropical Dypsis species at Ralph's garden. Garden one: 15461 Devonshire Circle, Fountain Valley, CA 92683. Ralph Velez is one of the founding members of the PSSC, and his garden in Westminster shows what you can do on a suburban sixth-acre lot. Ralph is one of the original, dyed-in-the-wool consummate palm nuts. There’s not a lot that’s not on his lot. His garden was started in the early 1960s. Got a seedling Livistna carinensis? Raph’s got one, at maturity, in the ground. 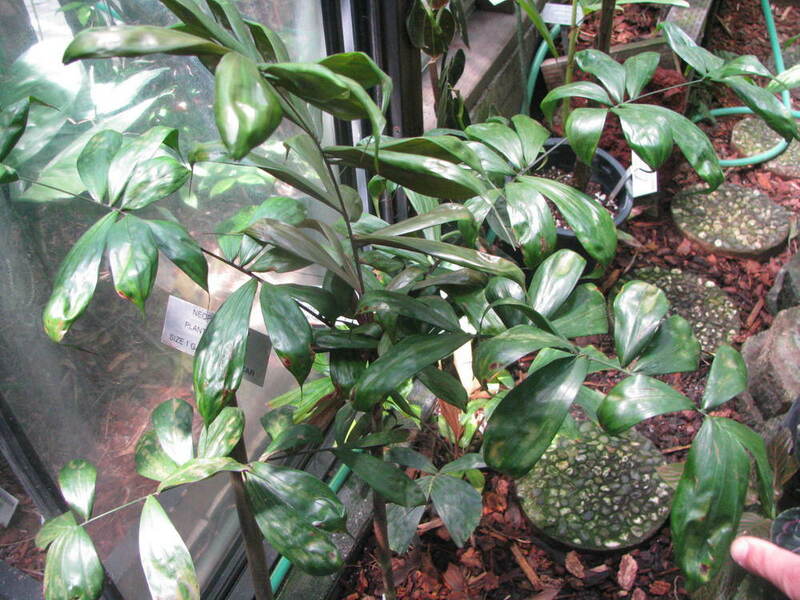 He has numerous rare Dypsis, Ravenea, and so much more. And that’s out front. Even if you’ve been to Ralph’s place recently, it’s hard to experience the full impact until you have seen the whole place, including his greenhouse and back yard. These palms have been around a while, some for more than 40 years. Garden two: Palm Island, Mile Square Park, Fountain Valley, CA. Palm Island is literally an island in a lake at Mile Square Park, with a bridge to it. 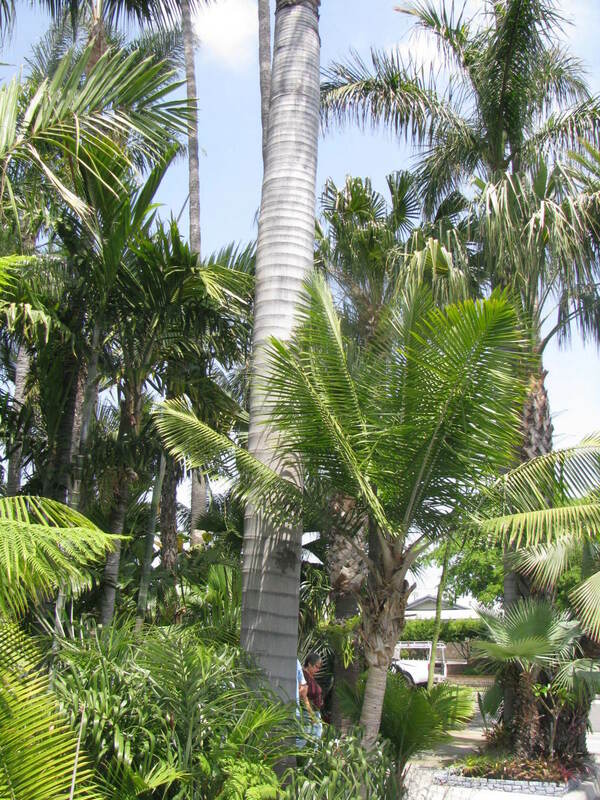 Many fine specimens of rare palms are planted there, in an unusual display in a public park. We thought it would be particularly appropriate to visit here, since Ralph Velez conced the idea and got the Orange County Parks people to share his vision. Palm Island has proven to be an unusually favorable habitat for tender palms, in large part because it’s surrounded by a lake. Tender palms like Hyophorbe seem to thrive there, when they fail only a quarter-mile away. Roystonea on Palm Island. This wasn't planted yesterday. There will be a potluck lunch and plant auction at Palm Island. Chicken will be provided; other courses that you like would be greatly appreciated. Not sure what to bring? If you like it, chances are, so will the rest of us. Salad, side dish, dessert, all are appreciated. You don’t even have to cook it yourself. If you buy it and bring it, we’ll eat it. There will be seating for all in the picnic shelter. Water and soft drinks will be offered at a nominal charge. Restrooms are right nearby. There is a small charge to park in the lot, or park for free at curbside on nearby Edinger and Euclid Avenues. For the auction please bring rare palms. Please, no Phoenix canariensis, Washingtonia, etc. The best sizes are in 1 to 5 gallon pots. You can donate 100% of the proceeds to the PSSC or 50% for the PSSC and 50% to the donor. Checks and cash accepted. Big, bad Bismarckia on Palm Island.